Thanks for the reply. Are you adding a bit of an angle into the bracket to lift the rear of the seat up? The bracket they show just raises the seat and doesn't change the angle. I feel the same about my seat. 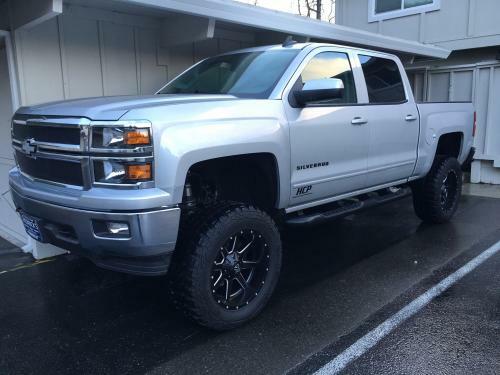 2015 Silverado. I wish it was raised a little more at the back. I didn't have this issue in my 2009. Would you mind providing the eBay link so I can see the bracket? I might do the same this weekend. Thanks! Chris , I have a 2015 LT Chevy. I had the MVI car play radio conversation. Would I get a cluster from a 2015 since my truck is a 2015 or a cluster from a 2016 since the radio is from a 2016? Thx! This is great news if you can make it work for us Silverado guys. Thx! looks great!!! What a steal on those seats! Emblems look fantastic too! Make sure you post pics! Who did the work for you? Thinking about leather in mine. You're going to love the blacked out emblems. Looks so good on my ride. Good to know! Great idea for a white elephant gift! Is that beer any good? Thanks!! Yes they came with the truck. I think it was standard on the LT line in 2015. I believe they sell kits on eBay to swap out your chrome ones for paint matched. Good luck. Everything works great. I've had some time to play with it and can happily report that there hasn't been any issues. Loving CarPlay and how simple it is to use. Maps is awesome. Also, I gained HD radio with the upgrade, that's pretty cool! The only downsides that I can think of: - No steering wheel "Talk" or "hang up" controls while CarPlay is on (still works through Bluetooth when not plugged into CarPlay) Not a major deal but a tiny inconvenience. Definitely not a deal breaker. I actually found that enabling "hey Siri" on your phone works well. You can hit the mute button on the steering wheel and use "hey Siri" it works pretty good. - Loss of pausing or rewinding live radio/xm. Again not a deal breaker for me as I rarely used this feature. - Loss of aux in port and SD card slot in center console. New USB ports do not have these. This might be a big deal to some people, not so much for me. Hope this helps. sweet car but you'll miss the truck! !